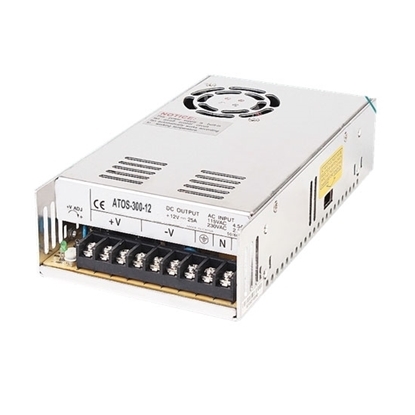 200W switching power supply converts AC input to DC at a stable voltage of 24V DC and rated current of 4.2A, and it is high efficiency, high reliability, competitive price and wide applications. Tips: Switching power supply output voltage is too low, how to do? Switching power supply load presents short circuit (particularly short circuit or performance of DC/DC convertor). In case of the foresaid condition, users need to clear load of the switching power supply to check working status of the power supply and the load circuit. If voltage output appears normal after cutting off load circuit, which means the condition is caused by overload. If voltage output remains abnormal, that means there is problem with the switching power supply. Failures of rectifier diode and smoothing capacitor at the output terminal can be confirmed by substitution. Deteriorating performance of switch tube will result in breakover failure which would increase internal resistance of the power supply and lower its load capacity.